Join us on Wednesday, April 19, at the American Swedish Institute to celebrate the publication of Scandinavians in the State House: How Nordic Immigrants Shaped Minnesota Politics by Klas Bergman. Klas will be joined in conversation by Tom Berg, attorney and former state legislator. Event details here. $5 per person, reservations requested. Klas will also share his book in Duluth and Marine on St. Croix. Growing up in Stockholm, Sweden I read–no, devoured–the epic tales by Vilhelm Moberg about the Swedish immigrants to Minnesota. Later, I became an immigrant myself and I continue to be fascinated by immigration and immigrant stories. In this book, I managed to combine that interest with my other great interest, American politics. It’s about how hundreds of thousands of Scandinavian immigrants in Minnesota, who started arriving in the 1850s, took part in building a new state, came to dominate the state’s politics ever since the breakthrough in 1892, and created the U.S. state that most resembles Scandinavia, both politically and culturally. This book has really been a wonderful and challenging project, full of great drama and fascinating personalities. Well, a lot of what I learned was new to me, and it might be new to many readers, for this aspect of the Scandinavian immigrant story is not widely known. But what surprised me, in particular, was the sheer number of Scandinavian politicians, at all levels in Minnesota’s society, and how they, often very soon after their arrival in the new world, became involved in politics, voting and running for office. They assimilated quickly; they wanted to become Americans. This is, I believe, a crucial part of the history of Scandinavian immigration to Minnesota, for these Scandinavian politicians helped create today’s Minnesota. What are the key ingredients in that political legacy? It’s been called a moralistic political culture, shaped by the Scandinavians together with those who came before them to Minnesota from New England, the Yankees. It’s pragmatism and a feeling of community and equality, with abundant cooperative activities. The idea of helping your neighbor is important, and nothing is more important than education. Former governor Arne Carlson talks about the “common good,” combining prudence and progressivism. Many Scandinavians also came to Minnesota for political reasons – why? Yes, there were thousands of them, Swedes and Norwegians but, in particular, Finns. Many of them were reluctant immigrants, blacklisted in their home countries for their political and union activities and unable to find work there. They left for America to find work, to survive. I call them radicals in exile, where, in Minnesota, they often continued their political activities, published newspapers, gathered in various political groups and parties, led the strikes in the mines on the Iron Range. When the American communist party was formed in the early 1920s, over 40 percent of its members were Finns. What were your sources for your research? In addition to reading extensively in the existing Scandinavian immigration literature and the rich Scandinavian language press in Minnesota, I found some previously unpublished material, which was very exciting. I also traveled widely around the state and conducted a large number of interviews with politicians, scholars, journalists, and others, including former leading Scandinavian politicians such as Walter Mondale, Wendell Anderson, Arne Carlson, and Roger Moe, as well as members of the present generation of Scandinavian politicians. The interviews were an essential part of my research, and they provide an important, extra dimension to my book. Minnesota’s population is changing. There are very few new Scandinavian immigrants. Will their political legacy survive when the new immigrants are Somalis, Hmong, and Latinos? That is the important question I try to answer in the book. Still, today, one-third of Minnesota’s 5.4 million residents regard themselves as “Scandinavians,” so, generally, the answer is, yes, that legacy will survive because it is so firmly entrenched in Minnesota’s political culture. But one cannot say this with absolute certainty, and only time will tell. Did the five Nordic immigrant groups play equally important roles in Minnesota politics? No, not at all. The Danes played only a modest role in Minnesota’s policy, although there were individual exceptions; the Icelanders were relatively few, but they distinguished themselves through their important newspaper, the Minneota Mascot; and the Finns put a radical stamp on Minnesota politics as strike leaders on the Iron Range and as numerous socialist and communist party members. But it was the Norwegian immigrants, who came from a not-yet-independent Norway, who took the political lead early on among the Nordic immigrants, and Norwegian-born Knute Nelson’s election victory in 1892 resulted in a century during which all but five of the governors were Scandinavians and during which two Norwegian Americans, Hubert Humphrey and Walter Mondale, were elected vice presidents of the United States. I think it’s for everyone who is interested in immigration and American history and politics and, in particular, Minnesota and midwestern history and politics. And at a time when immigration and refugee policy is high on the agenda the world over, the book is perhaps also a reminder of the importance of immigration and how the Scandinavians were received in Minnesota. They were welcomed, and their labor and their professional skills were needed. All this allowed them to create a new future for themselves and their families, which is why they came to Minnesota in the first place. Did you know that the Minnesota Historical Society Press is a member of the Association of American University Presses (AAUP)? In recognition of University Press Week, today’s post is by MNHS Press editor Josh Leventhal. A favorite activity on social media, and particularly Facebook, is posting old photos, articles, or other items that evoke days gone by. Whereas nowadays a photo is posted for all the world to see the minute it’s taken, photos that were taken decades ago have to be dug out of an old shoe box or photo album, scanned, and then uploaded to the digital world of the internet. This fascination with reliving, or perhaps reimagining, the past through old photos is on display in a new book of Mike’s photography, Downtown: Minneapolis in the 1970s, published by MNHS Press. With accompanying text by writer and artist Andy Sturdevant providing historical context and contemporary perspectives, the nearly 200 color and black-and-white photos in the book depict a city both foreign and familiar. Many identifiable landmarks are evident, and even some of the people featured in the images appear as if they could be dropped into the downtown Minneapolis of 2015 and look right at home, albeit with a throwback style. But, for the most part the photos tell of a city that was undergoing a transformation forty years ago, with new modern office buildings rising to the sky and elevated skyways crisscrossing the downtown streets. Their days numbered, independent retailers, restaurants, and movie theaters—now all since disappeared—were holding on to their places in the commercial landscape. The classic ’70s cars, the bell-bottom pants, the hairstyles, and other fashions all capture this distinct moment in the city’s history. It was an interesting experiment, of sorts, to see how images and subjects that had inspired such avid reactions on social media would translate to the printed pages of a book. Would the people who “liked” and commented on the images on Facebook go the extra step of purchasing the book? Did the fleeting posts on Old Minneapolis satisfy the viewer’s intrigue? The book has been out for only a few weeks, but if the response to the book’s launch event—being held this evening at the Mill City Museum in, of course, downtown Minneapolis to kick off an exhibit of Mike’s photos—is any indication, the experiment worked. With nearly 1,800 people responding with positive RSVPs—for a space that holds roughly 700 people—the event’s hours had to be extended and extra copies of the book brought on hand. Downtown offers a throwback look at an earlier time through stunning photos and the special characters—and the distinctive character of a city—they capture. The book is also a twenty-first-century reflection of the immediacy and impact of social media for sharing photos and memories and for bringing people together, both virtually and in person, to celebrate those recollections. The Minnesota Historical Society Press is pleased to announce My Grandfather’s Knocking Sticks: Ojibwe Family Life and Labor on the Reservation by Brenda J. 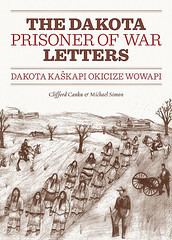 Child as the winner of the Jon Gjerde Prize for the best book in midwestern history published in 2014 as awarded by the Midwestern History Association. My Grandfather’s Knocking Sticks explores the innovative ways Ojibwe men and women on reservations around the Great Lakes sustained both their families and their cultural identity in the face of extreme prejudice and hardship. Brenda J. Child is professor of American Studies at the University of Minnesota and author of two other books, Boarding School Seasons: American Indian Families, 1900-1940 and Holding Our World Together: Ojibwe Women and the Survival of Community. My Grandfather’s Knocking Sticks is also the winner of the Labriola Center American Indian National Book Award. The mission of the Midwestern History Association is to promote the study of the history of the American Midwest by way of organizing and supporting academic discussions and conference presentations and panels related to the region’s history and culture. Jon Gjerde was professor of American History at the University of California at Berkeley and distinguished historian of immigration and European-American ethnic groups in the Middle West. He completed his doctorate at the University of Minnesota. More information on the Star Tribune “On Books” blog. This photo of me with my granddaughter, Emma Drury, was taken at Folsom House in Taylors Falls, Minnesota, on April 25, 2015. We were celebrating the recent publication of my book, The Crops Look Good: News from a Midwestern Family Farm. Based on a collection of family letters, the book is an intimate portrayal of family farm life in the region – first-person history, written as it was being lived. My mother’s letters to her eldest sister, beginning when she was seven and continuing throughout middle age, make a significant contribution to the story. The Folsom House event on April 25 was very special to me, for several reasons. Fifteen-year-old Emma planned and hosted my reading in this gracious home, built in 1855 by lumberman, historian, and Minnesota state senator W. H. C. Folsom. Five generations of the Folsom family occupied the house, which still contains their original furnishings, library, and personal effects. It is now operated by the Taylors Falls Historical Society, in partnership with the Minnesota Historical Society. My parents, Harvey and Helen Hellerud, who farmed for decades in Polk County, Wisconsin, retired in 1976 and moved across the St. Croix River to Taylors Falls. As an accomplished pianist, my mother entertained Folsom House visitors on the Hews rectangular grand piano (shown in the background of this photo) on many occasions. She also served as a volunteer guide during the 1980s and 1990s. Her affiliation with the Taylors Falls Historical Society was a great joy to her during many productive years of retirement. Now Helen Hellerud’s great-granddaughter Emma is volunteering at this beautifully preserved historic site. And I have enjoyed the privilege of sharing my book about a place that has been important to my family and history lovers throughout the Upper Midwest. Here is a poem I wrote ten years ago, in recognition of a rich heritage, a craving for deep identity, and our interwoven lives. splashing the vacant lot behind my mother’s house. and necklacing herself with blooms. how you can braid an ornamental rope from flowers. is working three stems at a time, all different lengths. that way you never break the chain. Emma plops down in the deep wet grass. in a field of yellow tassels. and crown each other with our handiwork. Saturday, March 28 at 7:00 P.M. The year 1865 saw inauguration, abolition, armistice, assassination, grief, celebration and reunion. The brand-new frontier state of Minnesota mourned and commemorated along with the rest of the nation. Minnesotans celebrated the return of the troops and got down to the business of building railroads and cities, sprinkling the countryside with farms and lumber camps and welcoming immigrants by the tens of thousands. Dan Chouinard and an all-star group of friends gather to paint a Minnesota portrait of the times through songs, letters and newspaper accounts, in Civil War Homecoming. This live show at the Fitzgerald Theater on Saturday, March 28 is a co-production of the Minnesota Historical Society, MPR and the Minnesota Civil War Commemoration Task Force. Featuring Kevin Kling, Maria Jette, T Mychael Rambo, Prudence Johnson, members of the Roe Family Singers, and the Brass Messengers as well as Eric Jacobson, Annette Atkins, Gwen Westerman, Mark Ritchie, Dean Urdahl, Pat Bauer and David Geister. Where was Santa on December 13, 1961? What was Santa doing in Minneapolis fifty-three years ago? Why spreading cheer in the Sky Room at Dayton’s in Minneapolis, of course! Here he is at the store’s children’s breakfast on December 13, 1961. This photograph, along with many other charming images of children in Minnesota, is featured in Wishing for a Snow Day : Growing Up in Minnesota by Peg Meier. Digging through letters, diaries, reminiscences, newspaper columns, and plenty of photographs, Meier unearthed a wealth of material left by Minnesotans who took the time to write, whether as children in the moment or as adults looking back. Also by Peg Meier: Bring Warm Clothes and Too Hot, Went to Lake. C-SPAN’s Cities Tour recently visited St. Paul, profiling various literary and historic sites and interviewing local historians and authors. Featured segments were broadcast on BOOK-TV and American History TV and can be viewed via the hyperlink above. Minnesota Historical Society staff as well as MNHS Press authors Paul Maccabee, Dave Page, and Adam Scher helped C-SPAN share the stories of the Capital City’s rich historical and literary past. 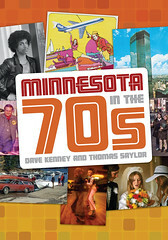 Minnesota in the ’70s Documentary Nominated for an Upper Midwest Emmy®! Minnesota in the ’70s, our documentary co-produced with Twin Cities Public Television’s Minnesota Productions & Partnerships (tptMN), is nominated for a 2014 Upper Midwest Emmy® Award by the Upper Midwest Chapter of the National Academy of Television Arts & Sciences in the Historic/Cultural/Nostalgic category! The 1970s were more than big hair, mirror balls, and leisure suits. These were the years that bridged the chasm between the anti-establishment tumult of the 1960s and the morning-in-America conservatism of the 1980s. In Minnesota, this evolution unfolded in ways that defied expectations. No longer was Minnesota merely a vague, snow-covered outpost in the American consciousness. It was a place of note and consequence—a state of presidential candidates, grassroots activism, civic engagement, environmental awareness, and Mary Tyler Moore. Its governor appeared on the cover of Time magazine. Its city skylines shot up with uncharacteristic immodesty. Its farmers enjoyed some of their best years ever. Minnesota forged an identity during the 1970s that would persist, rightly or wrongly, for decades to come. This is the second nomination for an MNHS Press/tptMN co-production. Last year, our Asian Flavors documentary won an Upper Midwest Emmy® in the Cultural category! We are pleased to announce that four MNHS Press authors have received an Award of Merit from the American Association for State and Local History (AASLH) Leadership in History Awards. The AASLH Leadership in History Awards, now in its sixty-ninth year, is the most prestigious recognition for achievement in the preservation and interpretation of state and local history. The Minnesota Historical Society also received Awards of Merit for three other projects: The Dred Scott Family and the National Debate over Slavery program, Play the Past, and Northern Lights: The Stories of Minnesota’s Past. This year, AASLH is proud to confer seventy-seven national awards honoring people, projects, exhibits, books, and organizations. The winners represent the best in the field and provide leadership for the future of state and local history. Presentation of the awards will be made at a special banquet during the 2014 AASLH Annual Meeting in St. Paul, Minnesota, on Friday, September 19. The banquet is supported by a generous contribution from the History Channel. The AASLH awards program was initiated in 1945 to establish and encourage standards of excellence in the collection, preservation, and interpretation of state and local history throughout the United States. The AASLH Leadership in History Awards not only honor significant achievement in the field of state and local history but also bring public recognition of the opportunities for small and large organizations, institutions, and programs to make contributions in this arena. The American Association for State and Local History is a not-for-profit professional organization of individuals and institutions working to preserve and promote history. From its headquarters in Nashville, Tennessee, AASLH provides leadership, service, and support for its members who preserve and interpret state and local history in order to make the past more meaningful in American society. AASLH publishes books, technical publications, a quarterly magazine, and a monthly newsletter. The association also sponsors regional and national training workshops and an annual meeting. Minnesota History authors Greg Gaut and Marsha Neff have won the biennial David Stanley Gebhard Article Award for “Downsizing the Public Realm: Building and Razing Winona’s Grand Post Office,” which appeared in the magazine’s Summer 2013 issue. Issued by the Minnesota chapter of the Society of Architectural Historians, the award considers articles focusing on some historical aspect of the built environment and published between July 1, 2011, and June 30, 2013. “Buildings ultimately represent the values of the creators,” the authors say. “Public buildings, in particular, reflect the political, economic, and cultural priorities of the societies that construct them.” “Downsizing” clearly makes that case. 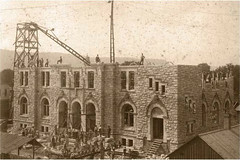 In 1891, the city of Winona proudly dedicated its imposing Romanesque-style stone post office, after citizens had convinced the federal government to enlarge its initial building plans, increase the budget, and spring for more expensive materials. In the 1950s, businessmen, led by the Chamber of Commerce, launched the fight–which they ultimately won–to tear down that “old fashioned monument” and erect a modern, one-story, no frills post office, taking out a city park to do so. The park was deemed a luxury and the new building “a fresh, clean look for a fine old city.” Two eras, two buildings, and a seismic shift in understanding the public realm. A three-judge panel selects the winning article from a minimum of five submissions. Gaut and Neff won the same award in 2008 for their work on the successful fight to preserve Winona’s county courthouse.